The name of the brand, Pulito Stato, comes from Italian and denotes a “pure, clean condition”. The brand offers a variety of cleaning products, such as sponges, scrubber pads, body scrubbers and even place mats, and conveys the message that housework and cleaning can be fun and easy. Each product is represented by an animal, such as a rabbit, a peacock, a cat or a giraffe, as well as a unique product spirit, and reminiscent of an animal also in its form. They all share the presentation with a smiling face as a symbol and self-reference of the brand. About one third of the transparent bag packaging is illustrated with one of the childlike sketched animals against a colourful landscape background. The bag allows a glance at the products inside, which are available in different colours. Following the motto of “Make your life full of colour and creativity”, the assortment piques the desire to start cleaning with them. The bag with zipper was designed to be reused serving a different purpose, embodying another well-thought-out feature of the green packaging concept. The packaging design of Pulito Stato consistently succeeds in conveying the message of the brand in a credible manner. 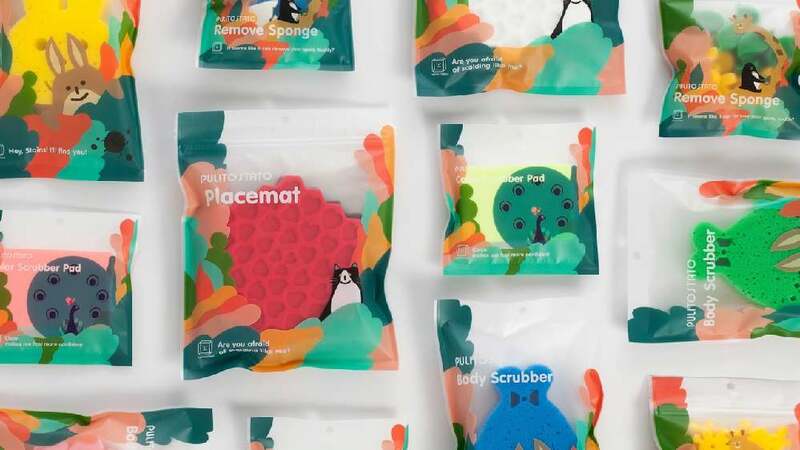 That cleaning can also be fun is visualised by both the colourful graphics with laughing animal faces on the packaging, as well as the formally adapted sponges or scouring pads featuring inside the package. Harmoniously and, above all, humorously linked to one another, they enhance the purely functional purpose of the products by projecting a charming appeal.